MIBFN proudly announces nine new board members who began serving on our Board of Directors effective February 26, 2019. These new members, Ambyr Amen-Ra, Jennifer Baragrey, Stan Bien, Elon Geffrard, Ellen Lassiter-Collier, Lonias Gilmore, Raeanne Madison, Natosha Sage-El, and Gayle Shipp join four other board members whose role is to provide strategic guidance to our work. 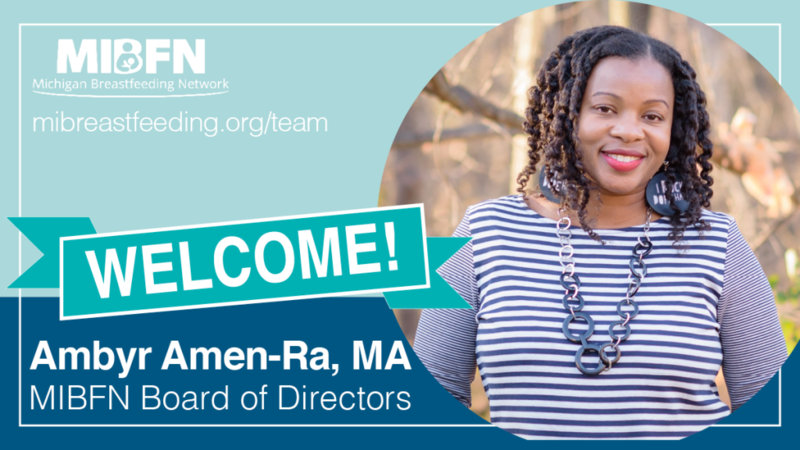 Ambyr Amen-Ra, MA: Ambyr is passionate about breastfeeding and has breastfed 3 babies in 6 years. She is glad that she is able to freely feed her babies. As a mother, Ambyr recognizes the importance of supporting the normalization of breastfeeding EVERYWHERE for EVERY mom. As an African-American mom, she supports MIBFN’s initiatives to promote the inclusiveness of black and brown moms and support their desire to breastfeed. Ambyr advocates for attachment and natural parenting. Ambyr educates parents on the benefits of using cloth diapers and hosts The Loss Mama Sanctuary: a session that creates a safe space for mothers who have lost babies to work through their grief. After her losses, Ambyr discovered the bond she shared with her rainbow babies during breastfeeding sessions helped minimize her grief. Ambyr has spent the last 10 years at the University of Michigan where she currently manages an archive for researchers and policymakers interested in Early Care and Education Data. 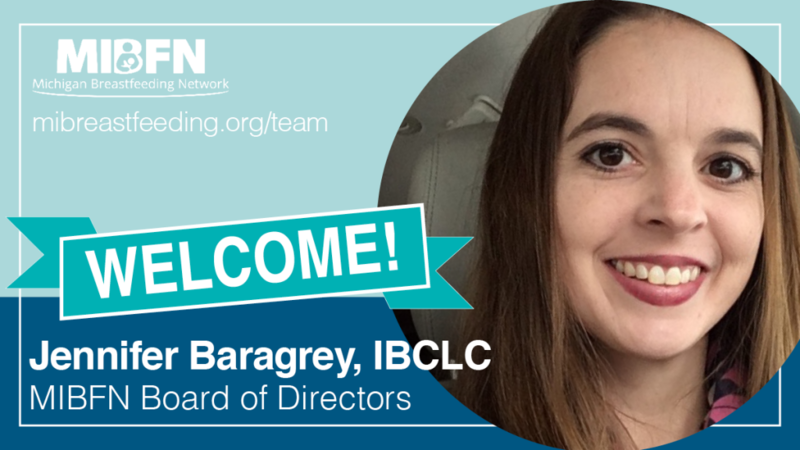 Jennifer Baragrey, IBCLC: Jennifer’s desire to see a change in breastfeeding education and support began soon after accepting a position as a Breastfeeding Peer Counselor with the WIC program in October of 2010. She had breastfed three children at that point and was still breastfeeding baby number 4 and number 5, twin girls whom were 16 months old. Seeing the disconnect between hospitals, WIC and healthcare providers drove Jennifer to seek a way to bring these people together to create consistent, accurate messaging. She obtained her B.S. in Maternal-Infant health in 2017 and passed the International Board Certified Lactation Consultant Exam in April of 2018. Now the proud owner of her own private practice, Nourish Me Naturally Lactation and Doula Services, she strives to offer excellent services in the rural area she resides. Jennifer has a goal of increasing access to breastfeeding information and support which led her to becoming familiar with MIBFN, as the organization has similar goals. Residing in Roscommon with her husband and five children, Jennifer and her family enjoy summer trips to Higgins Lake for swimming and fishing. She also has 2 grown children that still visit often which always proves to be a great time, especially for the younger siblings. The family enjoys camping, road trips, and game nights. Jennifer enjoys when she finds time to dive into a really good book and playing volleyball on the women’s league she has participated in for over 15 years. 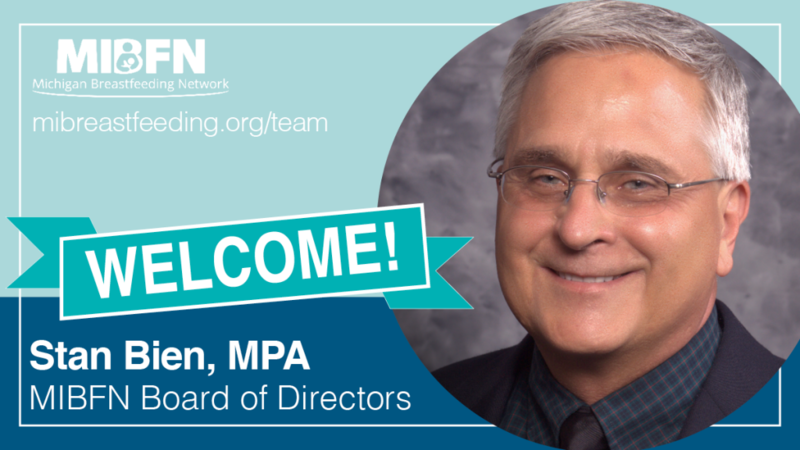 Stan Bien, MPA: Stan Bien worked in the Public Health field for over 40 years, most recently as the Michigan WIC Director and as a member of the NWICA Executive Board, making breastfeeding support and promotion one of his top priorities. Stan knows the powerful health benefits breastfeeding has on mothers, babies, and families. He graduated from Ferris State University with a B.S. in Accounting and minor in Economics, M.P.A. from Western Michigan University, was selected and completed the Public Health Leadership Development Program at the Michigan Public Health Institute. Stan and his wife Jeannie have three grown children and enjoy skiing, fishing, camping, walking, golf, traveling, and anything outdoors. Elon Geffrard, BS, CLC, ICCE is a graduate of Michigan State University and has worked in public health for over 5 years. She became a DONA trained birth doula in 2016 and Certified Lactation Consultant through her work as a home visitor. Elon saw gaps in support for the expectant clients she saw in the home visiting setting with immediate and trusted lactation support. As a result of this direct contact she saw an increase in initiation and duration of breastfeeding and human milk expression for her clients. As a result of engaging with women in her community, Elon grew passionate about creating a supportive “village” for expectant and new families. She provides community and private doula/lactation consultation services. She provides home visiting services within 24-48 hours to women who have normal lactation concerns and is currently providing doula support to incarcerated laboring persons. 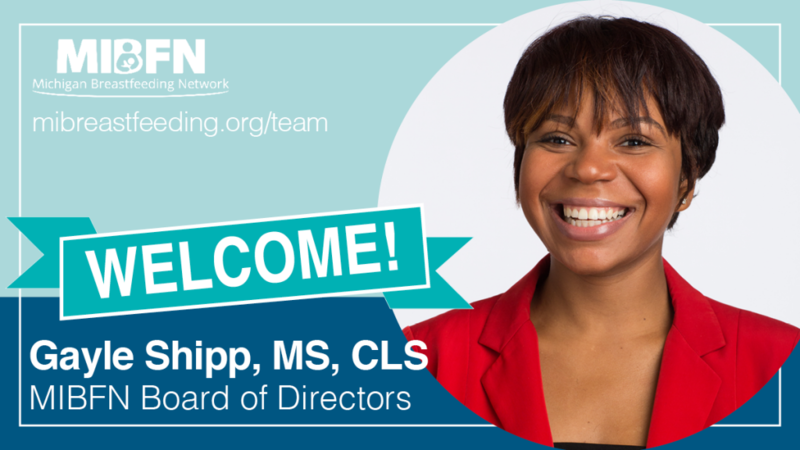 She joins the MIBFN Board of Directors with a recognition and passion of the collaborative power of this coalition and its ability to actualize change for the health of all Michigan families, especially those who’ve been pushed to the margins by systems of oppression and inequity. Lonias Gilmore, MPH: Lonias is a mission-driven public health practitioner. Her current role is as Childhood Obesity Prevention Specialist at the Michigan Department of Health and Human Services. Since 2011, her work has focused on the development, implementation and evaluation of initiatives that improve nutrition and increase physical activity among Michigan children. Lonias also provides consultation and technical assistance nationally to coalitions, workgroups, statewide partners, and community organizations on strategies to improve childhood outcomes. Her first opportunity to partner with the Michigan Breastfeeding Network was through the Healthy Kids, Healthy Michigan Coalition, identifying breastfeeding support policy priorities. That was only the beginning of a strategic partnership and a shared vision of barrier-free breastfeeding for Michigan women and babies. Her professional mission is to pursue social justice in health; to prevent and reduce health disparities and disparities in childhood outcomes. Her passion for breastfeeding is rooted in the science that proves human milk is the clinical gold standard for infant feeding and in the belief that health promoting behaviors and nutrition are more consequential for communities with poor health trends and for people who are vulnerable to poor health status and outcomes, especially Black women and other women of color. Lonias enjoys good food, good company and traveling the world. 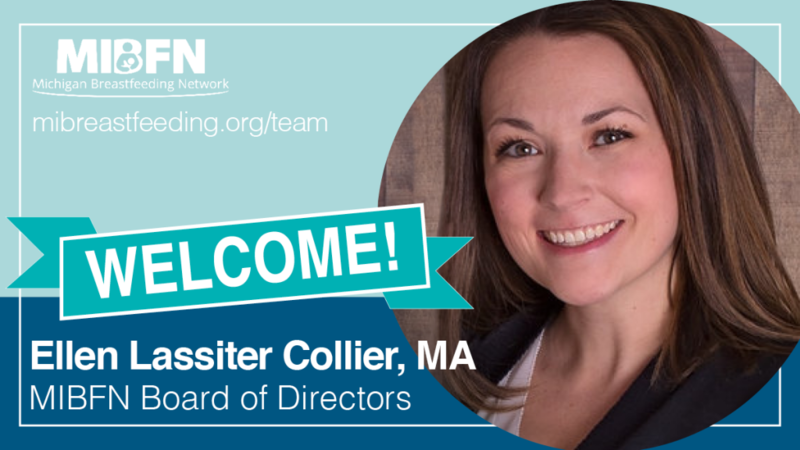 Ellen Lassiter Collier, MA: Ellen is thrilled to be joining the MIBFN Board as it brings together personal experiences and passions with her professional work. She is a mom of two, one self-weaned at 2 and the other is going strong at 9 months. As a full-time career mama, she has navigated all of the challenges that come with pumping, and also has donated to other moms as well as the local milk bank. Breastfeeding has been a central part of her life for the last 3 years. She has been connected with local breastfeeding groups throughout her journey and is excited to do the same on the state level. Professionally, she has spent her career advocating for equity. She is currently the Director of Gender Equity at Kalamazoo College and works every day to address issues of gender-based discrimination and violence. As a white woman, she has also committed to doing her own work in order to eliminate structural racism, create anti-racist communities, and parent in an anti-racist manner. The work never ends, but she continues to engage in spaces that allow her to be self-reflective, further understand power dynamics, and interrupt racist practices. She has a BS and MA in History from Northeastern University and is completing a PhD in Higher Education Administration at Bowling Green State University. Her dissertation focuses on the experiences of undergraduate student mothers, where breastfeeding access and support is a major theme. 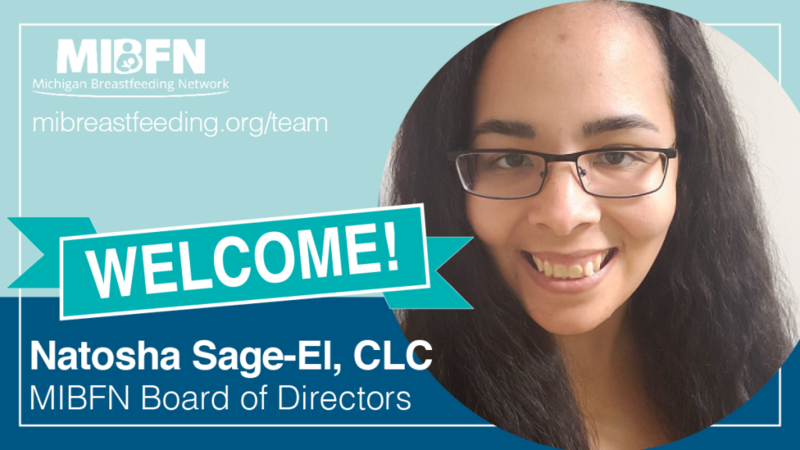 Natosha Sage-El, CLC: Natosha is passionate about breastfeeding because she loves to help families navigate through those beginning parental choices families are making before their family grows. She wants all moms to breastfeed but also realizes that each family has to figure out what works for them and this is what drives her work, helping them get to the end of the road. Natosha has worked as a Breastfeeding Peer Counselor for the Ingham County WIC program since June 2015. She has been a CLC since August 2015 and currently working towards her IBCLC. Natosha works for a private lactation clinic as well, Next Generation Lactation Clinic and teaches classes with Expectant Parents Organization. She still makes time to help facilitate the Capital Area Baby Café and the Black Breastfeeding Sisterhood. Natosha decided to serve with the MIBFN because she is passionate about the work and reaching moms throughout the state of Michigan and supporting different causes. Natosha has two boys who are full of energy. She also volunteers with Willow Tree Family Center and enjoys helping organize events throughout the year. Raeanne Madison, MPH, is a Crane Clan citizen of the Ojibwe nation and also carries Mexika (Nuahatl) ancestry. Ms. Madison is a Program Manager for maternal-child health programs at the Inter-Tribal Council of Michigan, where she has the privilege to serve Michigan tribal communities on initiatives related to infant safe sleep, breastfeeding, and women’s health. 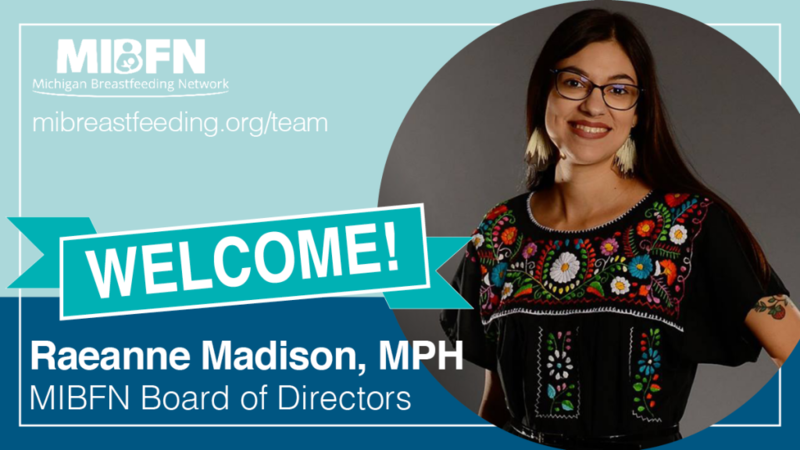 Ms. Madison is passionate about helping to elevate the unique needs of Michigan’s vast American Indian population to key stakeholders in medicine, public health, and the birth work world. 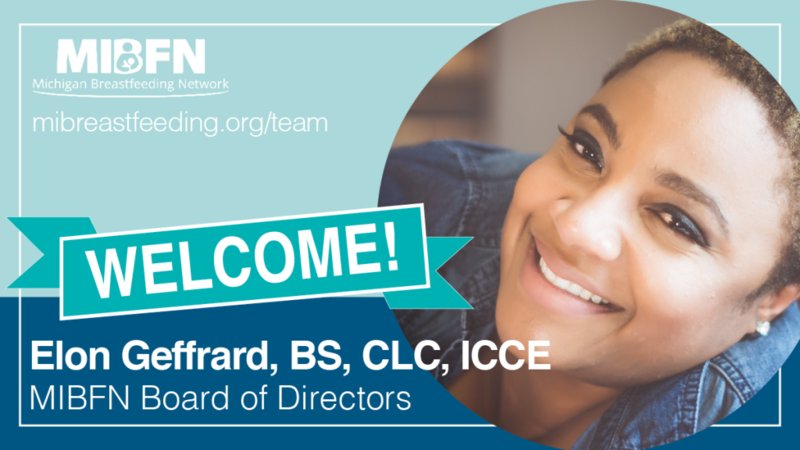 She recently joined the Michigan Breastfeeding Network Board of Directors to help shape the organization’s racial equity work. In addition to her work with the MIBFN, Ms. Madison serves on the March of Dimes Expert Advisory Committee, the Michigan Fetal and Infant Mortality Review Network, and the State of Michigan Infant Safe Sleep Advisory Committee. In her personal time, Ms. Madison is a traditional postpartum doula who provides care to new moms. She also teaches online classes on postpartum health and traditional parenting. Ms. Madison is a proud wife and homeschooling mom of two breastfed babies – one preteen and one newborn. Gayle Shipp, MS, CLS: Gayle’s passion for breastfeeding blossomed while working at WIC as a Nutrition Educator; educating and encouraging mothers to give their baby a healthy start that would last a lifetime. Her passion and interest grew further as her knowledge and awareness increased around existing systemic and structural barriers especially within the African American community impeding a mother’s ability to breastfeed. Gayle is now a PhD (c) in Human Nutrition also completing Dietetic requirements at Michigan State University and a recipient of Robert Wood Johnson’s Foundation’s Health Policy Research Scholars program. Gayle’s research is currently focused on understanding modifiable factors that influence breastfeeding outcomes with African American women. 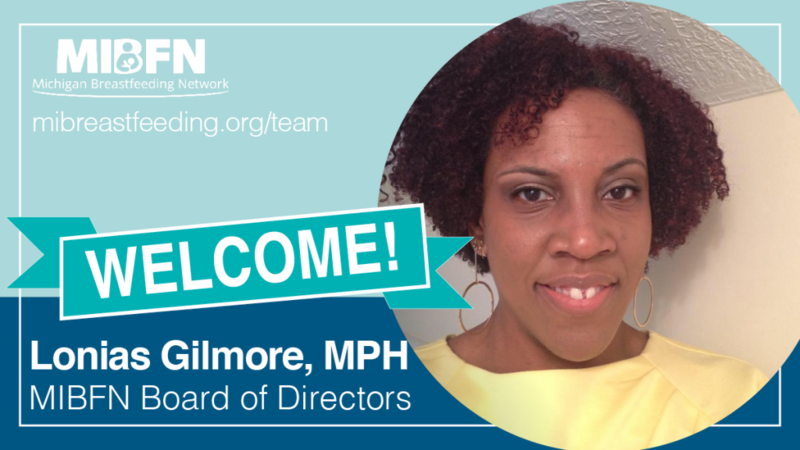 Gayle became a board member with MIBFN because this will give her an opportunity to stay connected with breastfeeding communities to work towards building a more supportive culture while removing societal barriers to breastfeeding success. Gayle is a mother of a beautiful daughter, which they enjoy spending their time traveling and with family and friends.